Blog,Is brushing your teeth more important than checking your feet? Is brushing your teeth more important than checking your feet? I have been to a few presentations and talks recently, raising awareness of Solesee to groups of podiatrists and people with Diabetes. Through listening to comments on feet and foot health I have had a few more thoughts about the importance of foot health within this sector. The more people I meet, the more this has turned into a crusade. My crusade is to change the way people think about the two parts of their body that are literally with them ‘every step of the day’. From the moment we get out of bed in the morning to the moment we get back into bed in the evening, they are supporting and transporting us, every second of every day. They give us our freedom and our independence, the ability to work and provide for our families, and support us in our enjoyment of life. Like all parts of our body we take them for granted…. until something goes wrong or we encounter a bit of pain. ‘My feet are killing me’ is a phrase most of us have used or heard before. How does this relate to the title of this blog? Do you think that brushing teeth is more important than checking your feet? Figures taken from the *NationalSmileMonth' say that 75% of adults do brush their teeth twice a day. Twice a day they take a few minutes to clean their teeth and check to see if there are any problems in their mouth. Subsequently the number of adults with no natural teeth has dramatically reduced from 37% in 1978 to 6% now. This increased awareness of good dental hygiene and regular cleaning has helped to improve the health of the nation's teeth. This is reflected in the number of adults with 21 or more natural teeth which has risen from 68% in 1978 to 86% today. If 75% of adults are brushing their teeth twice a day it must be clear that this is an important task and should be done. A huge amount of education is distributed to new mums, children and to the general public as to the importance of good dental hygiene and these figures show that in the last 40 years, more and more people are retaining their teeth. The habit of brushing your teeth twice a day is established early on in life. Indeed, like most habits, guilt kicks in if you happen to get into bed at night without cleaning your teeth, so much so, that it kicks you out again to grab the toothbrush and give them a quick scrub! Do you check your feet every day? The majority of people will probably answer ‘no’ to this question. That is all very well if you are sure that your pain receptors are working correctly to alert you when there is a problem. Yes – then it is clear, if I have a blister I will feel it, take my shoe off and put a plaster on it – job done! And oh yes, replace my tight-fitting shoes once I have put a plaster on the blister and I can hobble back to work. In feet where there is no problem with circulation, these will heal quickly. However, what about when you have diabetes? What happens when those very special nerve endings that tell the brain you have hurt yourself by ringing the alarm bells of pain, so that you react and take action, don’t work very well? This could be something as simple as the pain you assume you would feel when you leave your feet too long on a hot water bottle on a cold winters night. This is the pain that would tell you that you need to remove your feet from the hot water bottle or you will burn them. What happens when those ‘life saving nerve endings’ eventually stop working all together as happens with neuropathy? How will you know when your foot is too hot and has been burnt or has been cut, or you have been walking around with a stone in your shoe for days which has created a nasty blister? If the nerve endings stop working, the only way you will know you have a problem is when you actually look at your feet. Or someone takes a look at your feet for you. What happens if, at the same time as your nerve endings stop working properly, the blood vessels taking blood to and from your feet get damaged and therefore can’t transport blood as well as they used to? When this happens, blood doesn’t get to all parts of our feet as well as it should which in turn means that blisters or cuts won’t heal as quickly as they ought, if at all. With Diabetes, these complications can occur due to damage to the nerve endings and blood vessels. This results in cuts, blisters and breaks in the skin, which ordinarily will be healed quickly by the body, not healing at all. Not only has the body’s defense mechanism of pain been damaged but also the body’s natural healing ability has been affected. In these cases, a seemingly innocent cut can escalate rapidly to an ulcer, infection and potentially lead to amputation of the infected part, to stop the infection spreading to the rest of the body. In England, according to the latest figures from Diabetes UK, there are now 160 lower limb amputations due to diabetic complications every single week. This figure was 140 this time last year so the situation is clearly getting worse. Diabetes UK also state that 80% of amputations due to diabetic complications are preventable. Figures show that 8 out of 10 people who have suffered an amputation will die within 5 years of surgery. So why do you NOT check your feet daily but will brush your teeth daily – especially if you have Diabetes? Is it simply that you are all aware of the risks associated with not cleaning your teeth every day? i.e. could end up losing your teeth. If the motivation is vanity, surely losing your foot through amputation will have just as much effect on your day to day life as losing your teeth. I would argue more, due to the debilitating effect of losing a lower limb. I think it is more the lack of knowledge and awareness of how devastating the effects of diabetes on your feet can be. I also feel after speaking to many podiatrists and people with diabetes, that there is an apathy to foot care, an assumption that someone else will look after them. it is very common to hear that the relatives of people with Diabetes are also unaware of the potential danger to their loved one’s feet. 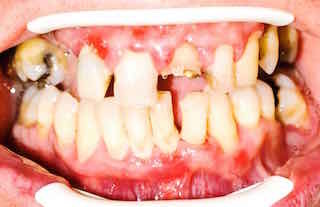 Why would you clean your teeth daily to help prevent this? But not check your feet daily to prevent this? After reading this blog I hope that you agree that it is equally as important to check your feet daily, as clean your teeth daily. We don’t even question why we clean our teeth every day now – we just do it. Establishing a habit of checking your feet daily will allow you to take responsibility of your foot health, just as you do your tooth health.